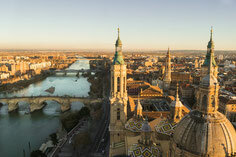 If you are planning to move to Zaragoza you will find a historic city of medium size in the north of Spain. It is very well situated, halfway between Madrid and Barcelona; it is also safe and affordable, and definitely cheaper than other, larger Spanish cities. Maños, the name of the people from Zaragoza, are friendly, nice, and warm. In general they are very social and helpful. For instance if you get lost in the city, just ask someone! They will not only show you where you are on a map but also accompany you to your destination. Zaragoza has a Mediterranean continental climate: cold winters and hot summers. The city has around 242 sunny days per year, it doesn’t rain very often!. For me the worst thing about Zaragoza weather is the “cierzo”, a strong wind, which can be very unpleasant. The wind can drop air temperature to up to minus 15, so bring a good coat with you! Although most people in Zaragoza will be able to speak some English, it is still highly recommended to learn some Spanish. Native English speakers are also in a high demand since everybody wants to practice their English skills. Zaragoza and Spain have a very good variety of food, from tapas to really nice restaurants. Bear in mind that we are not just talking about good food; it is part of the culture in an integral way. Do not underestimate the power of food in Zaragoza and Spain; Spanish people socialize around a table.